After graduating from Purdue University, Todd joined the CAD/CAM industry in both sales and technical support positions. In 1990 he joined one of the world's first rapid prototyping service bureaus, Laser Prototypes, Inc. His primary responsibility was sales and marketing with an emphasis on the development, management and growth of the company's representative sales channel. In 1995 Todd joined Accelerated Technologies, Inc. as manager of the company's Cincinnati, Ohio service bureau. During his tenure with Accelerated Technologies, he assumed the role of director of marketing and became a member of the executive management team. By 2001, Todd's responsibilities expanded to include marketing for the Ellison Group, which included Accelerated Technologies, Ellison Custom Coatings (an applicator of dry-film lubricants) and Ellison Surface Technologies (an applicator of thermal spray coatings). Todd is an accomplished writer and public speaker. Over the years, he has published more than two dozen articles on rapid prototyping. For the past two years, Todd has authored a monthly editorial feature, Perspectives, for the industry trade magazine Time-Compression Technologies. In February 2004 his book, User's Guide to Rapid Prototyping, was published. He has also contributed a chapter to McGraw-Hill's Manufacturing Engineering Handbook. Since joining the rapid prototyping industry, Todd has delivered more than thirty presentations at industry conferences and local events. The venues include AUTOFACT, MoldMaking Technologies, Rapid Prototyping & Manufacturing (RP&M) and AMCON. Todd has also served as an industry expert on numerous panels, and he has led the Future of Rapid Prototyping session in each of the past four RP&M conferences. 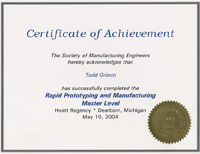 Master Level Certificate for Rapid Prototyping & Manufacturing. Awarded by Society of Manufacturing Engineers. Todd has served as an industry advisor for several associations. For the past five years he has been an advisor for RP&M, a trade show and conference sponsored by the Society of Manufacturing Engineers (SME). He currently serves as Chairman of the 3D Data Capture/Reverse Engineering tech group and has also been a member of the SME Rapid Prototyping Association's Peer Review Council. He has been an editorial advisor for Time-Compression Technologies. In 2002, Todd served as panelist for the National Science Foundations' Small Business Innovation Research (SBIR) grant review process. Todd is an active member of SME, Business Marketing Association (BMA) and Toastmasters International. Currently he is Vice President of Public Relations for the West Hills Toastmasters club. He received his Master Certificate in rapid prototyping & manufacturing in May 2004. In May 2001, he received his marketing certification from BMA through its Certified Business Communicator (CBC) program. Todd graduated from Purdue University in 1985 with a Bachelor of Science degree in Mechanical Engineering. To view Todd Grimm's résumé please click here. AIDA is the marketing model to use on all your campaigns. Without consideration of AIDA, your campaign may not produce sales results.